Celebrate the triumph of love with Chlobo's 2016 Love Always Wins collection. This stunning set features 3 Sterling Silver bracelets with faceted Silver beads for dazzling sparkle. 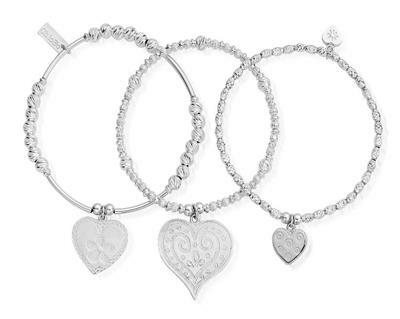 The cute heart motifs makes this set the perfect romantic gift for any loved one. Chlobo bracelets are elasticated to fit most wrist sizes.